The old Irish name Caitlin has had many spellings but none as strange as this. We have seen Katelyn, Catelyn, Kaitlyn but Australian mother Mavis decided on something completely different. Although 'Mavis' loved the name she decided it needed some changes to really stand out and revealed the revised spelling in a magazine - the photo of which was published on Imgur. 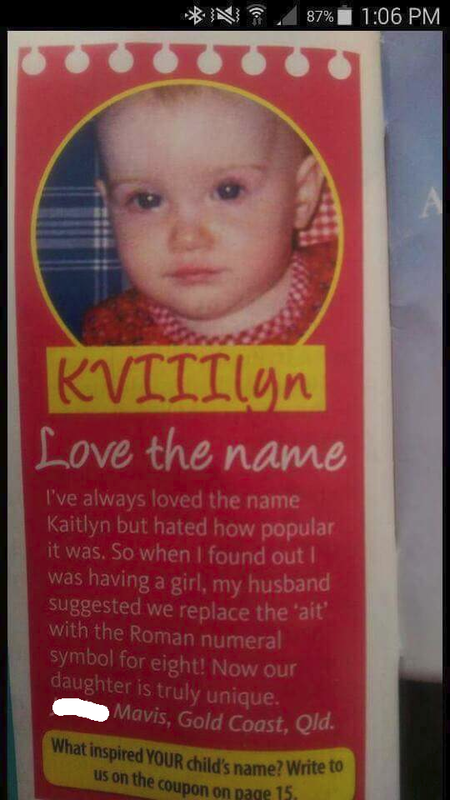 "I've always loved the name Kaitlyn but hated how popular it was." she said. "So when I found out I was having a girl, my husband suggested we replace the 'ait' with the Roman numeral symbol for eight! "Now our daughter is truly unique."